We just arrived home from a week in Germany, spent visiting friends and family. 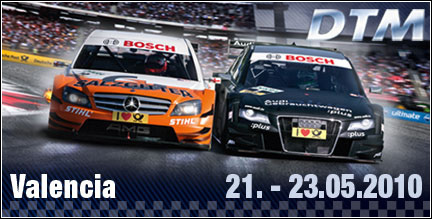 My head is swimming with all things sauerkraut, sausage and hefeweizen, so I was amused to see that Valencia is hosting an event for DTM, the German touring car championship, this weekend. I thought I had escaped die Deutschen, but no luck — Valencia will be swimming with them this weekend. Taking place at Cheste’s Ricardo Tormo circuit, the race is a warm-up for next month’s Formula 1 event. Ralf Schumacher (aka, the “other” Schumacher) is among the 18 drivers who’ll be present and zipping the touring cars at speeds of over 300km/h around the track. Tickets start at just €5, so if you like racing but can’t stomach shelling out hundreds of Euros for the Formula 1, this might be just the thing for you. The event’s ten races take place on the 21st – 23rd of May.